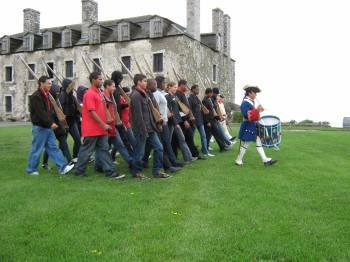 Our “Join The King’s Army” program is an educational experience meant to orient students to the history of Fort Niagara through a tour, and includes hand’s on experience training with an 18th century soldier. This training, consisting of a musket demonstration, and learning the 18th century manual of arms will give students a better understanding of Infantry tactics of the period, and the role of the individual soldier. During a “Work & Play” students will receive both an educational and fun experience that will give them a glimpse into the history of Fort Niagara. This program includes a tour of the fort to orient students to the site and explain the “big picture” significance of Fort Niagara. Students will also be instructed by a soldier in the use of a flintlock musket, through a demonstration by the soldier, and instruction in the manual of arms in order to better understand the tactics of the flintlock era, and the role of the individual soldier. 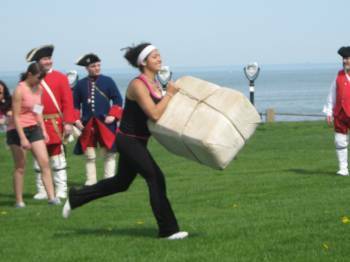 Soldiers need to relax too, and your students can join us in playing one of the games that soldiers of the period would have played here at Fort Niagara. Group leaders can choose French and Indian War (1750s), American Revolution (1770s) or War of 1812 themed-programs depending on what they are studying. Duration: Generally 3 1/2 Hours, however we understand teacher’s/leader’s time constraints and can accommodate a tighter schedule, and include time for things such as lunch or museum shop visits. Cost: $15.00 per person Maximum: 90 persons. This program features an in-class visit by a member of the fort staff, dressed in the military uniform of one of the fort's historic garrisons. The primary objective is to increase audience understanding of daily life in the target time period - with a special emphasis on activities and conditions at Old Fort Niagara. Using the uniform itself, as well as other items representative of a soldier's personal equipment and belongings (knapsack, haversack, clothing, blankets, games, utensils, grooming supplies, etc. ), the trials and joys of everyday life will be brought to life. "A Soldiers Life" can be tailored to a period which matches the educational goals of the individual school or educator. Programs focusing on the 18th century French and British, and early 19th century American occupations of the Fort are available. The past as more than just names and dates. Fact versus fiction, and the novel a source of both. 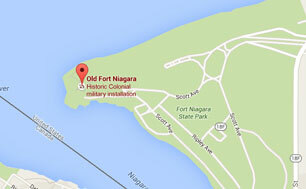 The diversity of the community within Fort Niagara and the Great Lakes during the French period of occupation. Transportation and geography in 18th century America. An introduction to the Fur Trade and the commercial forces behind colonization. An introduction to the French and Indian War. Vocabulary appropriate to the program.